Science fiction (วิทยาศาสตร์) movies are not a popular genre in Thailand. 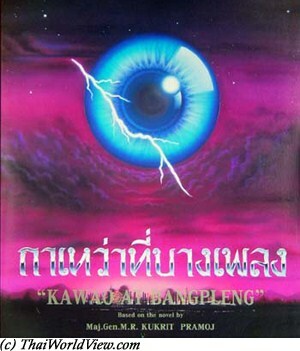 The first Thai Science Fiction movie was shot in 1972 only. In Thailand movie about spirits (วิญญาณ) are linked to Buddhist local beliefs. So they are more popular as connected to local culture. Thai people feel less concerned with Science Fiction movies as it is seen as something far away. "Spirit" concept is something more tangible in everyday life. Loi kratong festival is happening in a village close to Sukothai on a full moon night. Everybody is making wishes (get a baby, get married after two years of work in Bangkok...). Even the Buddhist novices wish to join the festive mood. Suddenly a huge mysterious UFO appears. People are paralyzed. A strong beam hits people. The UFO disappears and nobody can remember anything. On the following day, many women including teen girls, grannies, nuns vomit and are diagnosed as being pregnant! So all the 200 women of the village are pregnant simultaneously. The temple abbot knows that the phenomena is not natural but has no explanations. A doctor and a teacher investigate. One night, a mysterious beam hit the women again. On the following day, they deliver their baby after a few months of pregnancy only. The children grow fast. After one year, they look like four years old children. They are also more intelligent. They then all go to school. After 2 months, the first year program is already finished. Their behavior is different from other Thai children. They don't play childish games and always look in the direction of the moon. The children born from the nuns want to stay in the Buddhist temple and are the leaders of the group. They become teens very fast. One night, one teacher finds the children eating raw chicken. On the following day he is found hanged. On the funeral day, everybody is crying except them. They have no feeling, no consciousness of cold, heat, rain. Their leader challenges the abbot on Buddhist precepts and beliefs. A second man looking for frogs during rain time is found dead. Police inspector authority gets challenged by the children group. Their leader can hypnotize people. The children are responsible of cows and porks disappearance in the village. A dreadful cemetery is found with all skulls. They have a plan to invade the planet Earth. One of the children has more human feelings than his colleagues. He convinced the others to help stop a flooding. Following huge telepathic efforts, some of the children start to be very sick and are sent to hospital. Some of them die. The group leader sees the parents grievance and the efforts done by the villagers to save the children. He also understands that this world of birth, suffering, death is the reality as mentioned by the abbot. The UFO is finally taking them away. It is based on a book written by Kukrit Pramoj. There were a controversy about plagiarism when it was released as a similar movie adapted from the book The Midwich Cuckoos(1957). This movie can be seen as the teenage confrontation with society, as a fight between 2500 years Budding teachings and modern concepts from outside. 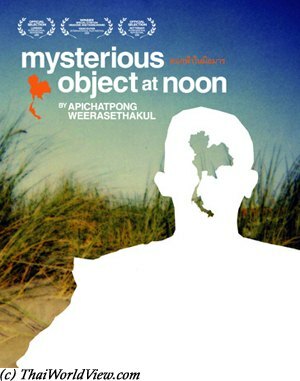 It is a Thai independent experimental documentary film directed by Apichatpong Weerasethakul. It is shot in black and white. It narrates the life of an Isan teacher called Dok Fa. Her father has ear problems and is paraplegic. She doesn't have enough money to cure him. A strange scar appears on her neck. While teaching a crippled kid, she faints. A mysterious round object is found close to her. A kid is inside the object. Dok Fa is dead. The mysterious kid transforms himself into the teacher. As Dok Fa is back to life, there are now two teachers. The story is disjointed. There is indirect narration through various people and also Molam (หมอลำ) song. Everybody has their own bits of the story. We never know it is true or not. A Thai boxing event is organized to raise money to cure Dok Fa's neck scar. Then various themes are raised (respect of others difference, politics : a war is ended and advantage to American business is given. There is opposition from Thai people promoting "Thai buy Thai" - reference to slogan ไทยช่วยไทย after 1997 economic crisis). It was shot in 1998 in South and Northeast of Thailand. The Culture Ministry registers 25 Thai classic films each year at the National Film Heritage Registry. 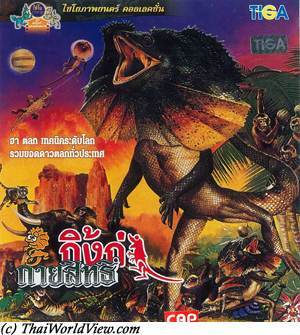 This movie is part of the 25 films heritage list announced on 04 October 2014, which is Thai Movies Conservation Day. When a huge meteor falls to earth in Surin provice, San and his school friends went to the site to take pictures. At the evening that meteor falls, three workmen whom fleed from a mysterious laboratory were killed, and their muscles had been torned out. Police and genetics experts started the investigation to find the truth of the death, and they found out the meteor has nothing to do with their deaths. The investigation leads to a secretive scientist who is conducting experimental work with human organs and working with a Cambodian witch. 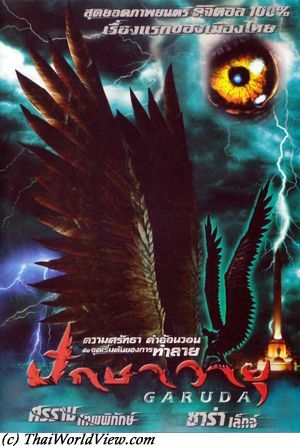 Thai movie Garuda (ปักษาวายุ) was released in year 2004. In year 1977 an archaeologist dies after discovering an old teeth in India. The action jumps to year 2004 in Bangkok during MRT construction. A solid rock is found during tunnel excavation. It features a weird head similar to a dinosaur. Veena (Sara Leigh) wishes to study it but businessmen don't trust her as she is only half Thai (ลูกครึ่ง). Veena's father is the one who died in Egypt many years ago. She believes it could be a dinosaur linked to the mythical garuda. She goes back to Kalasin. One day her university lecturer calls her to come urgently to Bangkok. A secret entrance has been found behind the rock. Heavily armed (มีดหมอ) soldiers seem to be hiding a secret. Veena flees and through a diversion, her farang friend Hoi Tim cuts the electric generator but is awakening the beast (สัตรโบราณ) staying in a tree. The garuda beast does a rampage on soldiers. Veena is spared due to the teeth talisman of her father. Thai people believe it is a mystical animal (เป็นเทพ). Saen, leader of the soldiers, just wishes to avoid any more killings. 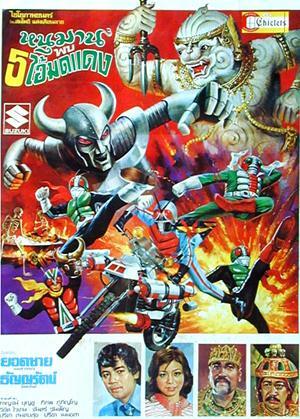 The Garuda succeeds to escape from the cave and causes a rampage in Bangkok. Attracted by Veena's talisman, Saen succeeds to injure severely the garuda and kills it. This Thai SciFi movie page 1 contains 10 records.